Windows 10 to launch in July.... Seriously? Lisa Su, Advanced Micro Device's CEO, last week said that Microsoft would launch Windows 10 in three months. During a conference call with Wall Street, Su -- whose company is a Microsoft partner and preparing hardware for the new operating system -- revealed the timeline that Microsoft had previously only said was the more nebulous "this summer." "What we also are factoring in is, you know, with the Windows 10 launch at the end of July, we are watching sort of the impact of that on the back-to-school season, and expect that it might have a bit of a delay to the normal back-to-school season inventory build-up," Su said while answering an analyst question about AMD's second-quarter plans (emphasis added. Microsoft declined to confirm Su's timetable. "Microsoft has said Windows 10 will launch this summer," a spokeswoman said in an email. "We have nothing additional to share." At first blush, the schedule seems audacious. "Whether it is July, August or September, there isn't an immense amount of time left [to wrap up Windows 10]," said Wes Miller, an analyst with Directions on Microsoft. Su's reference to back-to-school -- the U.S.'s second-biggest PC sales period -- implied that hardware with Windows 10 pre-installed would be available in time to make at least the back end of the season, which peaks in July and August, then slows significantly by mid-September. But can Microsoft make Su's deadline? It depends on what one means by "launch." "There are several dates that matter when we're talking about Windows," said Steve Kleynhans of Gartner. "One is when it gets sent to OEMs [original equipment manufacturers], which is way before you or I can get it. Then there's the date that enterprises can get it. And then the day it shows up on 'shelves.'" Kleynhans' point? Although computer makers may have Windows 10 in time to put it on new hardware to sell through part of the back-to-school season, that doesn't necessarily mean Microsoft will deliver the free upgrade at the same time it hands the OS to OEMs. Even so, the schedule appears daunting: Microsoft has issued six versions of its Windows 10 preview for the desktop and larger tablets, but only a pair for smartphones and small-sized tablets. It added the new "Project Spartan" browser just three weeks ago. And the previews' quality has been uneven. "Is it realistic? I don't know," said IDC analyst Al Gillen when asked about July. "It's certainly months earlier than I expected." But Su could be on the mark. "If you do have to hit a late July product launch, remember that there's no packaging at this point," Gillen added, referring to Windows 10's electronic delivery, whether to OEMs or later, users. "So it all depends on how quickly it takes to push [hardware] into the channel." Yet there is another factor this cycle that hasn't been present prior: Microsoft's radical overhaul of its OS development and maintenance scheme. Rather than release the OS, then support it only with minor bug fixes and security patches while working towards a successor in three years, Microsoft will rely on an accelerated release tempo that will constantly add incremental features and functionality, and change the user interface (UI) and user experience (UX), of Windows 10. "Windows 10 may never really be considered 'done,'" said Kleynhans. That gives Microsoft an unheard of flexibility, one not even Apple -- which went to annual upgrades for OS X in 2012 -- has tried to match. "The world's changed," opined Gillen. "Microsoft could deliver a 'base' version of Windows 10 in July for OEMs, but continue [to enhance it] until even early 2016, when they could declare a 'stable' build." Under Gillen's scenario -- which was also promoted by Kleynhans -- the relentless development will let Microsoft squeeze out something acceptable, if not to the standards of past editions, to make OEMs happy, then for the short term use the next weeks to improve it for upgraders. Over the long term, Microsoft would incrementally augment Windows 10. There's risk in that strategy. If the initial release's quality generates negative first impressions, Microsoft will have a hard time recovering Windows 10's reputation. "Microsoft is taking this new servicing plan for Windows 10 very seriously," said Gillen. "But if they don't make good, they might as well pack it in and go home." All three analysts expected much from next week's Build, which runs April 29-May 1 in San Francisco. 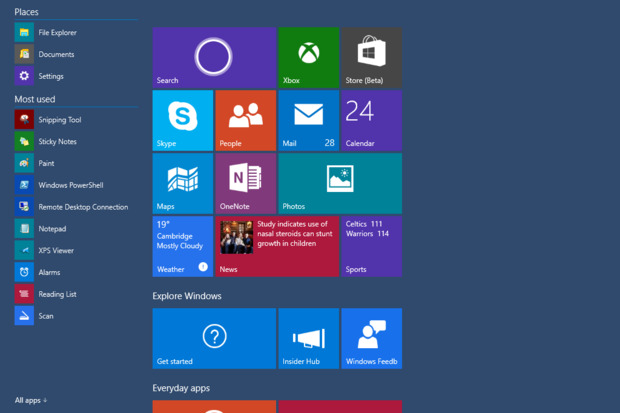 Microsoft will likely release an update to Windows 10's preview at its developers conference. "I think we'll see a pretty significant ... build ... at Build," predicted Miller.